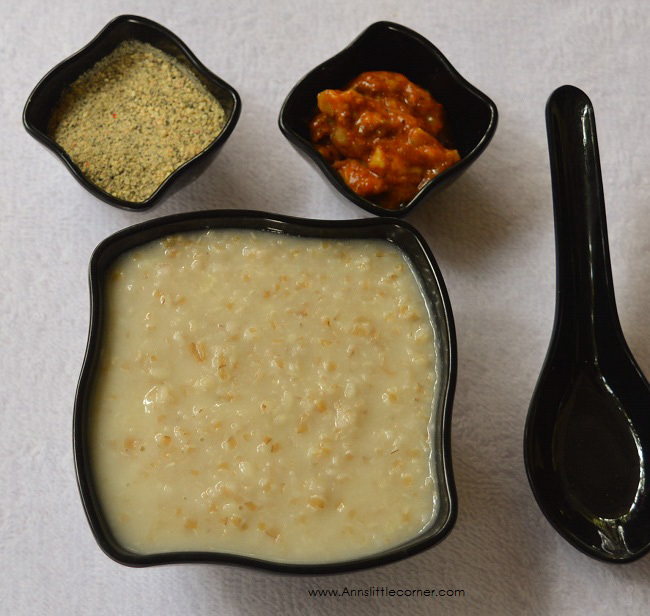 Wheat Urad Dal Porridge is a bowl full of health and goodness. A great option to start a healthy day. 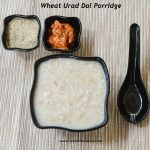 I have used broken wheat and White Urad dal for this porridge. Garlic Cloves are added which brings in flavour to the porridge. This porridge is very well suited for a diabetic diet. 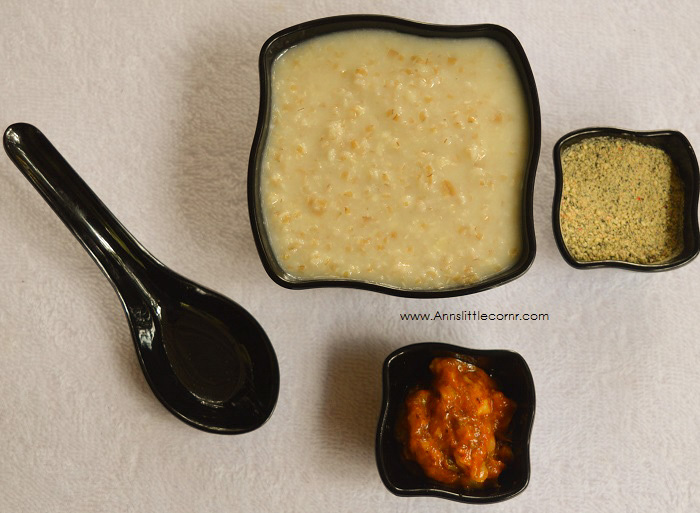 Wheat Urad Dal Porridge can be served with Onion Coriander Seed Chutney or any other spicy side dishes. 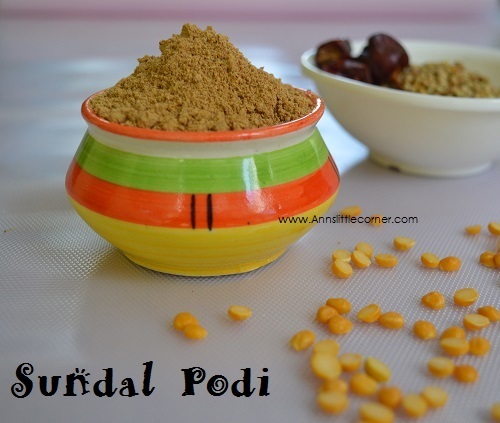 Wheat Urad Dal Porridge / Gothumai Ulundhu Kanji is a healthy and filling porridge. Wash and Clean Broken Wheat and Urad Dal. Add them into a pressure cooker. Add in 4 cups of water, Salt and garlic pods. Pressure cook for 4 whistles in medium flame. Switch off the flame. Allow the pressure cooker to release pressure on its own. Open the pressure cooker. Heat the cooker again add 1 cup of water and cook in medium flame for 5 minutes. 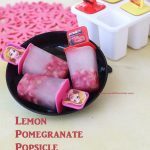 Add in a cup of milk and cook in low flame for 5 minutes. Switch off the flame. Wheat Urad Dal Porridge is now ready to serve. Healthy and Nutritious Wheat Urad dal porridge is now ready to serve. The Porridge tends to thicken by time and when the heat reduces. So adjust the water accordingly. If you are not comfortable with coconut milk substitute it with cows milk. It tastes equally yummy. 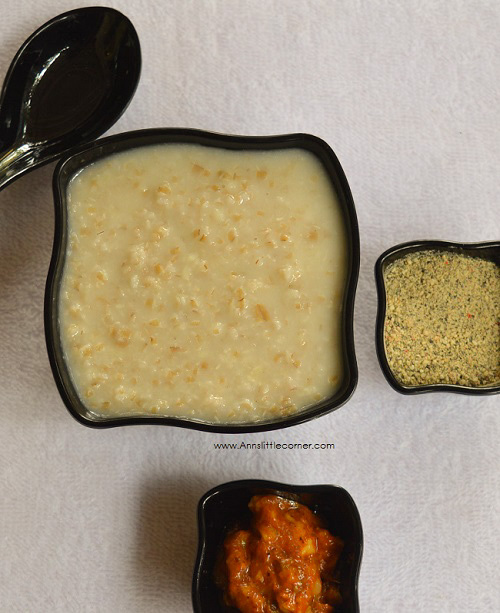 Wheat Urad Dal Porridge tastes best with any spicy side dish or chutney. Use a bigger pressurecooker or the water in the cooker might over flow. 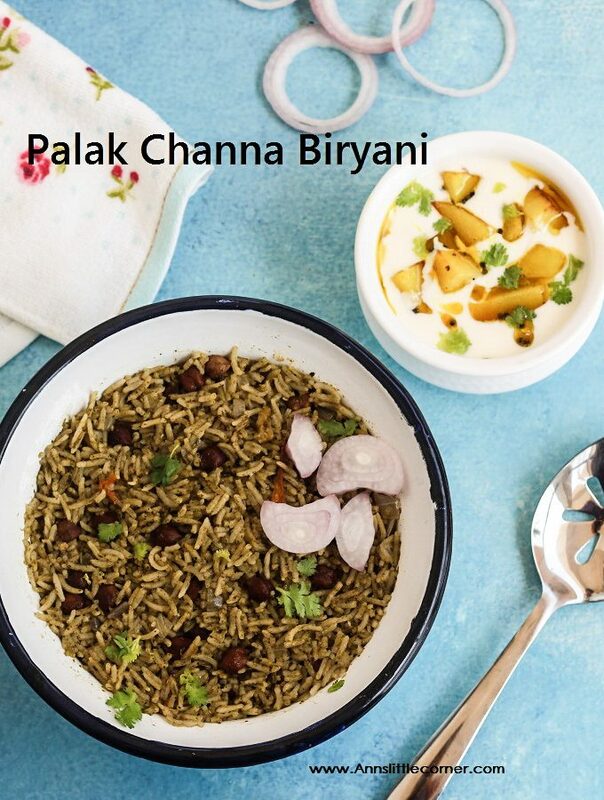 As an alternate the urad dal and Wheat can be soaked in water for an hour. Then only 2 cups of water (i.e 1:2 ratio of contents:water} is sufficient to pressure cook. Pressure cook for 4 whistles in medium flame. Switch off the flame. Allow the pressure cooker to release pressuer on its own. Open the pressure cooker. I consider this porridge a simplified dessert. No, no, not complaining but wholeheartedly accepted. Such a pleasure.